Still on the subject of brownies, some recent experiments have finally borne fruit. For no particular reason that I know of, it occurred to me that salted chocolate brownies might be a good idea. By now we’re all familiar with salted caramel, which seems to be enjoying a spike in popularity though it isn’t by any means a recent innovation. The practice of combining sweet and savoury flavours is at least as old as the recorded history of cooking, and the inclusion of a little salt not only helps balance the sweetness of these brownies, but also mellows the bitterness of the dark chocolate, subtly transforming its flavour. I’ve included salt-caramel pistachios as well, and it’s well worth the minimal trouble of making them. 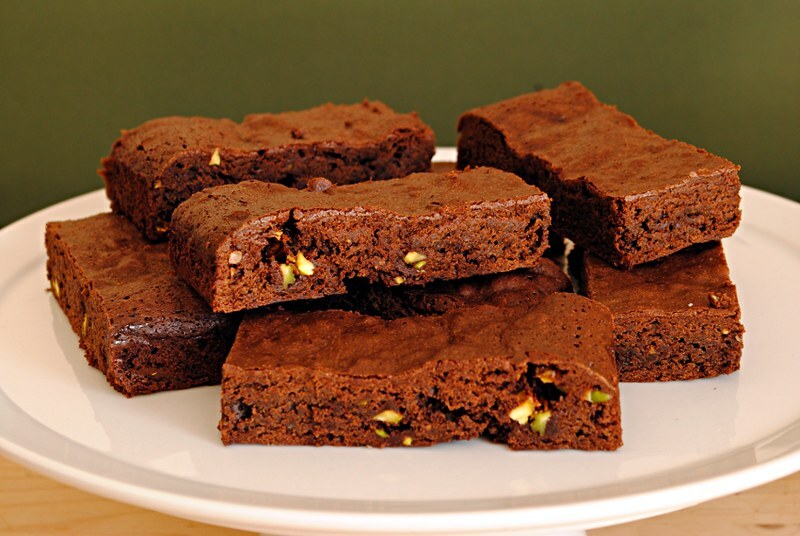 Pistachios, with their distinctive, buttery flavour and flashes of bright green flesh, are the perfect complement to these brownies. My ex-partner reckons she can’t fault them. And that’s saying something. You can use any sort of salt you like, but the more conscientious baker will probably go all Halen Môn and opt for sea salt flakes. If you go down this commendable road, it’s worth grinding the flakes first – they don’t dissolve easily in the brownie mixture. Now, to work. Prepare the pistachios first, as the caramel will need to cool and harden before they’re added to the mix. You can leave the nuts whole or roughly chop them, depending on preference. You can break them up by bashing them with a rolling pin or some other blunt instrument, but I find this gives uneven results, leaving some of them whole while reducing others to dust. Melt the sugar and salt in a saucepan over a medium heat. Watch it closely, and stir with a wooden spoon if it looks like it’s beginning to burn in one place while not yet melted in another (electric hot plates are particularly prone to hotspots that can cause this). Once all the sugar has caramelised, add the pistachios and give them a good stir to coat them thoroughly. Remove from the heat and tip the mixture onto a sheet of baking parchment or silicon. They will form a sticky mass, but don’t worry about that right now. Leave them to cool while you prepare the brownies themselves. In a heatproof bowl set over a pan containing a couple of centimetres of simmering water, melt the butter, chocolate and salt. Once melted, transfer to a mixing bowl and stir in the sugar and vanilla. Once that is thoroughly incorporated, add the eggs, stirring briskly. Finally, beat in the flour until the mixture is smooth. Sieving the flour or adding it from a shaker will make it easier to mix it in without it forming lumps. 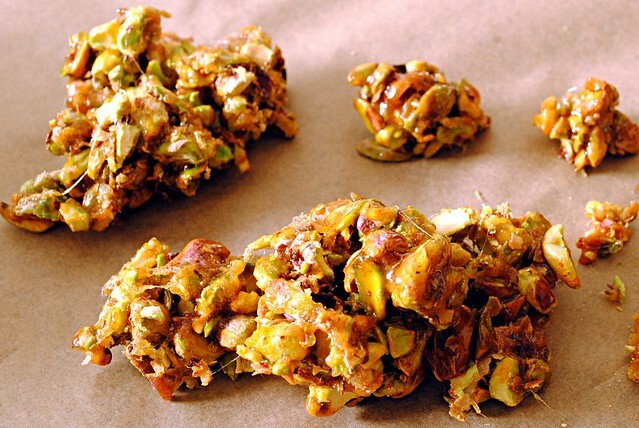 Break the mass of caramelised pistachios into small pieces – despite my injunction about bashing nuts with a rolling pin, you can be more brutal now that they are locked in a matrix of hardened sugar. Actually, I use a meat mallet for this, and have used a claw hammer in the past. This operation will make a bit of a mess and you will probably need to recover fragments of pistachio from the far corners of your worksurface. Anyhow, once this is done, stir the nuts into the brownie mixture, and pour it into a foil or parchment-lined tin (this recipe makes enough to fill a 20x30cm swiss roll tin). 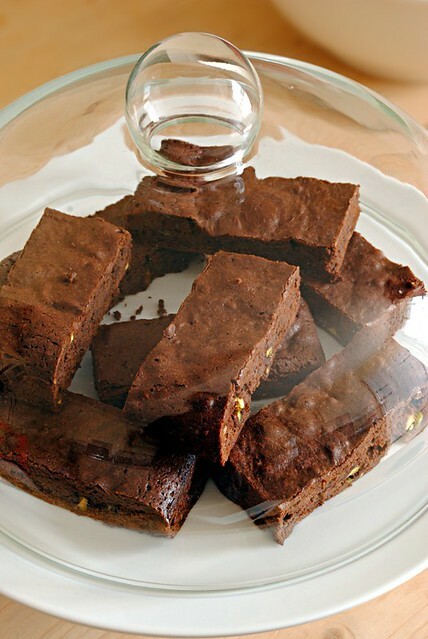 Bake for 20-30 minutes at 180°c, until a skewer inserted into the brownie comes out clean. Rapidly cooling the tin in a centimetre or so of cold water in the bottom of the sink will prevent the residual heat from continuing to cook the brownies and help keep the interior softer for a more fudgy texture. When cool, lift them out and cut into squares or rectangles. I haven’t tried making these brownies with milk chocolate, but I doubt if they would work as well: I can’t imagine that the relatively rich flavour of milk chocolate would complement the tang of the salt. The vanilla isn’t essential but, used in moderation, it does seem to play off the other flavours quite well. I like my brownies cold, but with a scoop of vanilla ice-cream they’d be pretty good still warm from the oven. With all that salt, sugar and fat, they aren’t exactly health-food, but as a grown-up treat I don’t think they need to make any apologies.